An artificial intelligence may be replacing your dermatologist. An artificial intelligence (AI) algorithm, originally made to identify cats and dogs, is now diagnosing cancer. Using an existing Google algorithm, Stanford University scientists created a dataset that they could use to train a neural network. The team gathered images from the internet and worked closely with university dermatologists and professors to collect a total of about 130,000 images of skin lesions that cover 2,000 various diseases. Based on this database, they then taught the algorithm to differentiate between a deadly skin lesion and a patch of dry skin. The algorithm was designed to “figure out a problem rather than having the answers programmed into it,” the team said in a statement. This means that the more images it sees, the better it gets at classifying lesions. 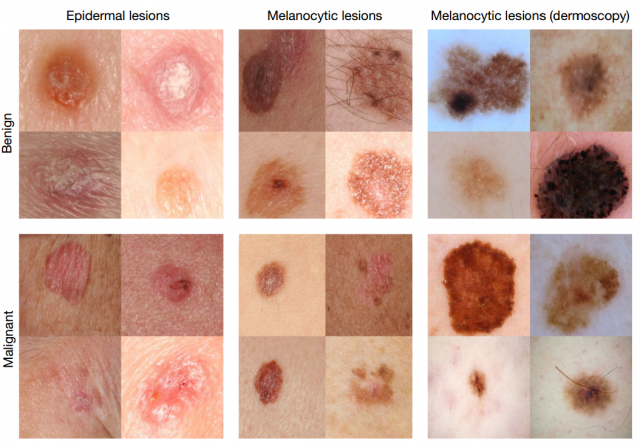 To test the algorithm’s performance, the researchers pitted its results against the diagnosis of 21 dermatologists in three diagnostic tasks–keratinocyte carcinoma classification, melanoma classification, and melanoma classification when viewed using dermoscopy. In all three tasks, the team found that the algorithm was able to match the expertise of human dermatologists within 91 percent. The key to this success is the AI’s ability to take a massive amount of data and analyze it quickly. This is something that human physicians, sadly, cannot do themselves (or at least, they can’t do it with nearly the accuracy or efficiency). The system looked at the woman’s genetic information and compared it to 20 million clinical oncology studies. After doing so, it determined that the patient had an exceedingly rare form of leukemia. Accuracy, however, isn’t the only priority for Stanford’s AI system. The team is also working towards making this technology accessible via smartphone so that even those with limited healthcare availability can get the help they need. “My main eureka moment was when I realized just how ubiquitous smartphones will be. Everyone will have a supercomputer in their pockets with a number of sensors in it, including a camera. What if we could use it to visually screen for skin cancer? Or other ailments?” ” said Esteva. These researchers are busy refining the algorithm and trying to better understand how it makes decisions. But hopefully soon, this potentially life-saving technology will be available for all with a smartphone. And, in the future, if this technology is adapted for other ailments or purposes, the future of healthcare could be bright even for those who cannot afford insurance. This could, in the long run, save many, many lives.